In the summer of 2014, as the wheat fields of Norfolk began to turn their customary gold, long-time London stylist Jamie Hoskins left The Big Smoke to pursue his dream of creating the perfect salon, here in the fine city of Norwich. 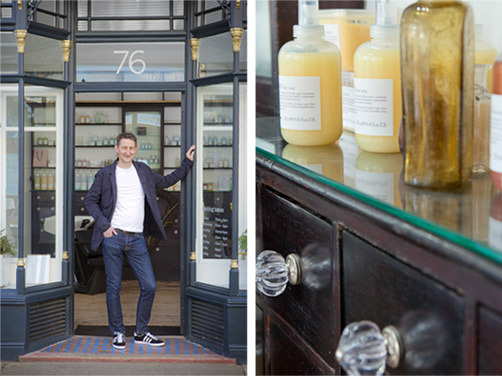 In Upper St Giles Street, a creative hub where individualism flourishes and independents thrive, Jamie found the ideal home for his venture – No.76, a beautiful former apothecary’s shop. Keeping the original fixtures, he mixed them carefully with bespoke furnishings sourced from around the world, soft washed linens, layered mirrors – distilling old and new for you to enjoy. Step into No.76 and you can be sure you will be well looked after in a truly relaxing environment as Jamie and his team carry out their mission to improve the health, hydration, nourishment and all round well-being of your hair. So your hair not only looks good but is good – and you, in turn, feel great. In their pursuit of your happiness Jamie and co are ably assisted by Davines, an Italian range of hair care products committed to sustainable beauty. As natural as it is modern – Davines is the perfect partner for Hoskins Hair. Just as we hope Hoskins Hair will be the perfect partner for you. And, if colouring has ruined your hair, we have exciting news. We have introduced Olaplex a new treatment to repair the broken bonds, returning your hair to its original healthy state.